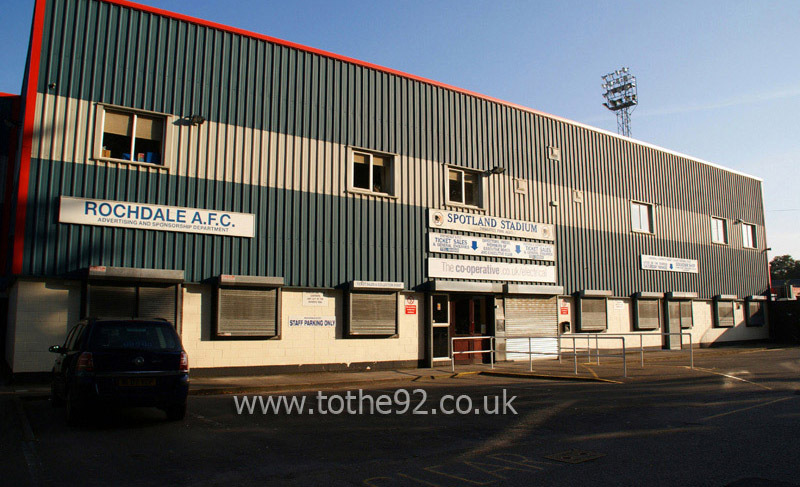 Over the past 10 years, Spotland has been re-developed. The only remaining stand pre this period in the Sandy Lane end and is also the only terraced stand left in the ground. The more vocal home supporters stand here. Opposite this stand is a single tiered all seated stand with two supporting pillars which can block your view of the action. The main stand has a number of pillars and also houses the executive boxes. Up to 3,600 visiting supporters can be accommodated and will be situated in the Wilbutts Lane stand running alongside the pitch. Views are unobstructed and very good whilst leg room, facilities and refreshments are all more than reasonable. Studds, is the name of the Rochdale social club situated under the Pearl Street Stand. It serves food, has two TVs, and opens at midday on Saturdays, and from 6 pm for midweek matches. They do allow a few away fans in but you're probably best off keeping club colours covered. The same goes for 2 other pubs situated at the stadium - The Ratcliffe Arms and The Church Inn. All of which are very nice and reasonably priced establishments. There is a small chippy on Wilbutts Lane which serves a fantastic portion of fish and chips for just £3. Well worth a visit and don't let the queues put you off. Alternatively, within 1 mile you'll find a McDonalds and a Pizza Hut. There is only permit holders parking at the stadium itself and street parking is very limited due to the residents only schemes. There are a few private car parks with the most recommended of which being Oulder Hill School. The school is located on the way up to the ground, on the left hand side, along Sandy Lane. Be aware that the walk to the stadium is uphill and approximately 10 minutes away. The back after the game is a lot easier however! The nearest / closest train station to Rochdale's Spotland Stadium is Rochdale rail. This is approx 3 miles from the ground. There is a direct bus service from the station on match days. The bus leaves the station every half hour (15 and 45 past) and takes you direct to the stadium. Travel: Drove every time here. parking was never a problem until this pre season! Always just parked on the street, twice behind the away end. But they've put double yellow lines there now so I’m screwed! For the play-off game, I got there very late and there was a far bigger crowd than most will see at Spotland, but still managed to find a space. Turn left at the crossroads by the Cemetery pub, then left again into a little housing estate and there is plenty of room there. Refreshments: The Wilbutts Lane chippy is infamous for it's gravy! And with good reason, right behind the away end, it just has to be worth a visit! Other than that, the local Rochdale delicacy is pie and peas! .. Couple of pubs nearby, the above mentioned Cemetery is a little walk from the ground but is the designated ‘away’ pub. There is another one on Wilbutts Lane just next to the away end to though, and two bars on the premises at the ground, so plenty to choose from. Impressions: Dale is the only ground other than Everton and Wigan where I have now sat on all 4 sides. I've even been in the tunnel, players entrance, kit room, press room and press box so it's fair to say I know Spotland well! It is quite basic, but does a job for a club Dale’s size. Good size terrace at one end and 3 all seated stands. It is probably the only ground in the country where the away fans get by far the best stand in the ground! 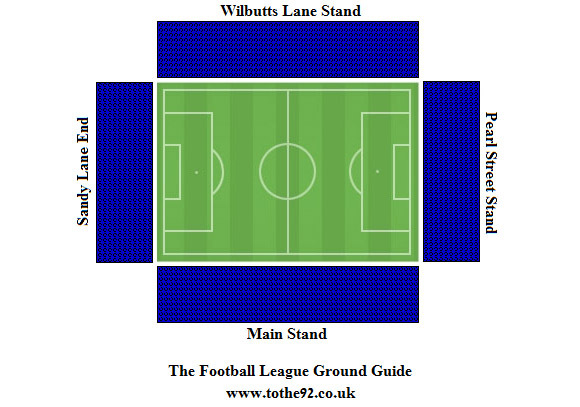 The Wilbutts Lane Stand runs the full length of the pitch, is pretty steep and is the only stand in the ground without any pillars! Atmosphere: All four stands have outstanding acoustics as well, so even when there is a regular small crowd on, the atmosphere is pretty good. When its full and the team has just won a play off semi final on penalties to reach Wembley for the first time in the club's history, all after being 2 goals behind… well, it's fair to say it's pretty good then as well! Anything Else: Rochdale are quite unique of all the clubs I've been to that they actually play music other than the latest chart stuff! Always guaranteed some decent music, some rock, some old school stuff, they were playing Slade and ELO on my first visit which was very different! Enjoy: One of my favourite neutral grounds, obviously since I've been back 3 times! Everything about the place is just a pleasure, good food, good fans, good atmosphere and totally relaxing day out. Have you been to Rochdale's Crown Oil Arena? To tell us about your experiences and to feature on the site, simply complete the fans review form below!